Last week, I showed a '66 Ford Mustang which, at first, sounds good, but when the owner decided to add a touch screen radio on the dash, 72.22% of the voters had quickly voted CP. 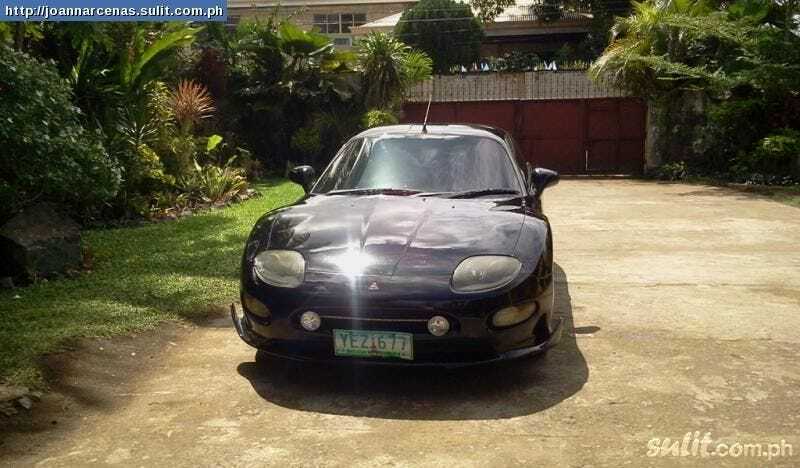 Now, let's go small with another JDM treat, the Mitsubishi FTO. LHD countries will have a problem remembering this car because it was made for RHD ones like Japan (obviously) and the UK. The FTO was one of those front-wheel-drive compact sports cars competing against the Honda CR-X Del Sol, the Mazda MX-3 and the Toyota Celica. The 1997 MY version had the plucky 2000cc 24 valve DOHC MIVEC V6 engine, the one we have here, creating 197 HP. It may be small, but it does come with great agility and cute looks. This version, however, does have its flaws. First, the interior is awful; as if the owner wanted it to look like the Batmobile. Second, its transmission is a 5-speed tiptronic autobox, so no manual fun. Third, well, it's far from where I live.